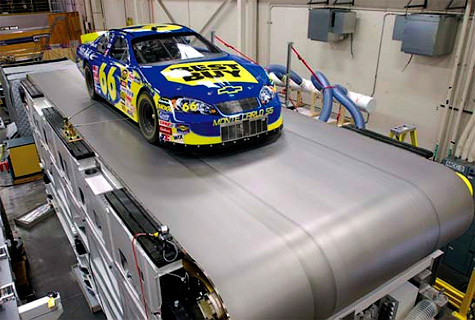 Haas Automation and Jacobs Engineering has built a treadmill for cars, why? Because it's meant to go inside wind tunnels. Sounds extreme right? But according to them totally worth it. This is because for aircraft, which wind tunnels were designed for, don't have any surfaces around them to mess with the experiment. However a stationary car in a wind tunnel does. And this causes some errors in engineer's calculations. So how to solve the problem? Built a treadmill capable of supporting a car and that can spin fast enough to have a car moving (stationary) at over 180mph! This way their is a road surface that is moving and the tires are also spinning, now engineers can more accurately measure wind that moves around a vehicle's underside, which is VERY important especially to race cars, which this whole bonanza is meant for. as you can see this is no normal treadmill, the belt the car sits on is one continuous piece of 1mm thick steel. There are also several sensors that can take more readings around areas that previously haven't been accurately studied. The facility when finished will be able to be rented out to other racing teams. So expect greater advancements in aerodynamics. The treadmill should be operational soon as these images were released some time in 2007. And the facility was opened just 14 months ago, just over a year ago. 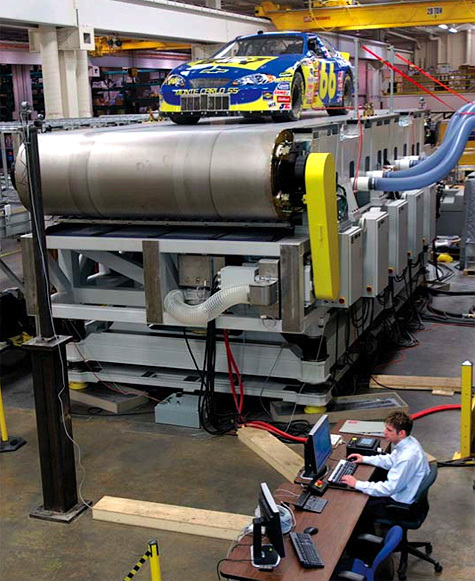 More info can be seen at WindSheer.com which I believe to be the main page for the rolling wind tunnel. Pretty good video on the behind the scenes.